Tooele County is perhaps best known as the home of the expansive Bonneville Salt Flats, remnants of the prehistoric Lake Bonneville. The 40-square-mile flats are fascinating (and home to numerous land speed records), but their name belies one of the most important things to remember about adventuring in Tooele County: It’s anything but flat. You’ll definitely notice the hills when you’re out for a road bike ride in northwestern Utah. One of the best things about road cycling in Tooele (pronounced too-will-uh) County is the area’s relative solitude, especially compared to busier areas like the Wasatch Front to the east. 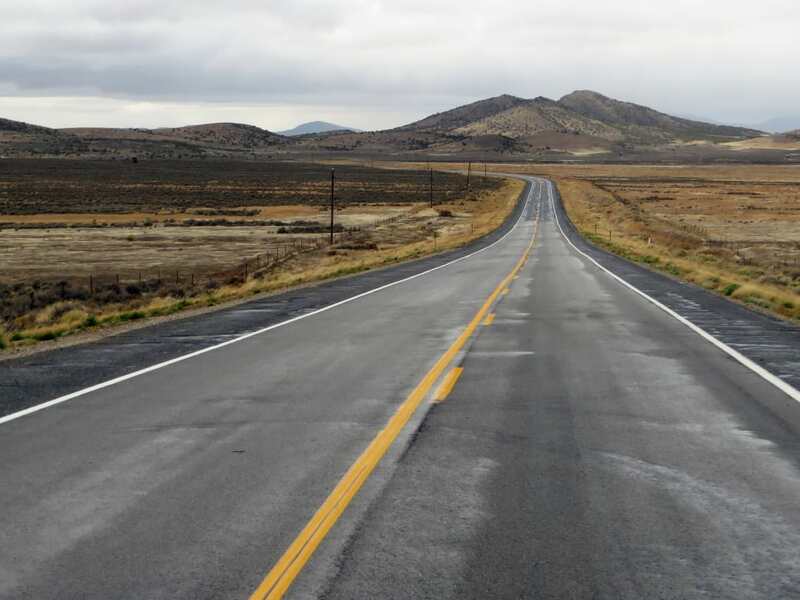 You’ll find some motorist traffic on Highway 36 (between Tooele and Lake Point) and on Highway 112 (between Tooele and Grantsville), but other than that, you’ll likely have the roads largely to yourself. Even in Tooele Valley, where the county’s population is most densely concentrated, you’ll find that the roadways see only light traffic. This goes for weekends, too. The Tooele County Trails Committee, an endeavor of the local county commission and parks and recreation departments, is dedicated to mapping and providing information on local trails and road cycling loops. It’s an ongoing project, but visitors can find lots of maps on its website, and printed maps are available at brochure stands in the county and in numerous bike shops in the Wasatch Front. At just over 14 miles, the Benson-Gristmill Loop is an excellent introduction to road cycling in Tooele County. There’s little elevation gain (just over 200 feet), and the loop itself is well signed, and begins and ends at the Benson Gristmill East Parking Lot in Stansbury Park. During the northern Tooele Valley’s boom days, the mill was a crucial centerpiece to the area; it processed locally grown grains from the mid-19th century until the 1940s. The mill (the only one like it west of the Mississippi River) has been restored to its original glory and makes for an ideal launch point for a short ride. From the mill, you’ll head south toward Erda, then north on Sheep Lane and, eventually, make your way back via SR-138. The 4.6-mile Tooele Cross-Town asphalt path runs from the Oquirrh Mountain Trailhead at the southeast end of town all the way to the Mid Valley Trailhead on the northwest side of Tooele. The bike path was created because of heavy traffic on Tooele City’s Main Street. If you’re doing the ride as an out-and-back, start at the Mid Valley end so you can get the uphill out of the way first, then zoom back to the car. The bike path is generally clear year-round, so you can use it to get around town or for a quick ride anytime you’re in Tooele. Named for the area’s early Mormon pioneers, who first explored the route between Grantsville and Rush Valley, the 50-mile Mormon Trail Loop is considered one of Tooele County’s classic road bike rides. The asphalt loop begins at the Oquirrh Mountain Trailhead, adjacent to the Oquirrh Hills Golf Course in Tooele. Part of the loop is on Mormon Trail Road, which runs parallel to the Stansbury Mountains. Like most rides in Tooele County, you’ll often have the roadway to yourself, making it possible to enjoy the views of the Stansbury and Oquirrh ranges as you ride through Rush and Tooele valleys. The USA Cycling-sanctioned Ophir Road Race, held in July, offers three distances: 19, 41, and 68 miles. Courses conclude in the historic gold mining ghost town of Ophir, which was established and officially named for the biblical King Solomon’s gold mines in 1870. Numerous stone and wood structures still exist, along with dilapidated mining tunnels. The town makes for a great finish line, but the road riding before you complete the race is even better. On the longest of the course offerings, you’ll traverse Rush Valley, head up and over the Stansbury Mountains, and back, resulting in more than 5,000 feet of climbing. The 72-mile lollipop Rush Valley Loop gains nearly 1,800 feet and begins and ends in Tooele. It’s one of the more challenging road rides in Tooele County, but it’s well worth the effort for the opportunity to experience the area’s rich history. In addition to riding through historic Stockton, a remnant of the Utah Territory’s first mining boom, you’ll follow the Pony Express route, which passed through the county in 1860-61. You can also adjust the length of this loop. For a longer day, extend the ride to the ghost towns of Johnson Pass and Ophir; for a slightly shorter day, you can ride the loop as an out-and-back to either end of the Faust Road/Pony Express Trail. Conditions are typically good between March and November, but because services along the way are limited, plan to bring along plenty of water and nutrition and consider using a support vehicle. Written by Emma Walker for RootsRated Media in partnership with Utah Office of Tourism.